Public Works Roads Department Assam latest recruitment 2017 notification is out. According to the PWRD Assam Recruitment , Applications are invited from the citizens of India as defined in Article 5 and 6 of Constitution of India for filling up the following vacant post in establishment of Dhemaji State Road Division,PWRD, Dhemaji. 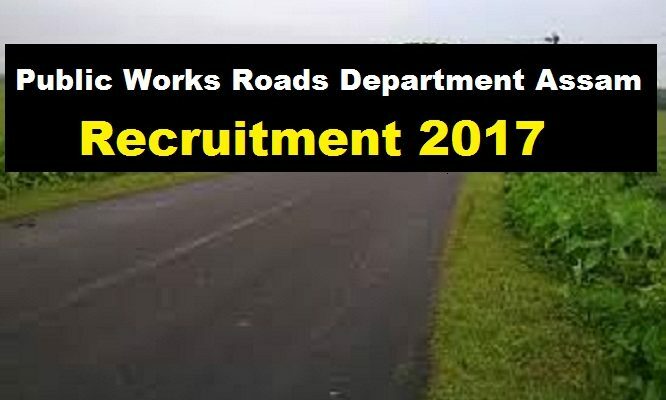 Following are the details of all posts under Public Works Roads Department Assam Recruitment 2017 with posts details, number of vacancies, age limit, salary, required qualification with application fee details. i)Minimum educational qualification of a candidate should be Graduate in any discipline from a recognized University. ii) The candidate must have good working knowledge of office productivity software tools(independent) of any operating system, i.e. MS Windows, Linux, Mac etc. such as Word Processor, Spreadsheet ,Presentation graphics, Concept of Database, Internet, E-mail etc. iii) The candidate must possess a minimum 06 (six) months Diploma in computer application/knowledge from an Institution recognized by the Govt. Age Limit : The candidates should not be less than 21 years and more than 43 years of age as on 01.01.2017. The upper age limit is relaxable by five (05) years for SC/ST candidates. The case of ex-serviceman, age limit is relaxable by two (2) years. The age limit of the candidates will be calculated on the basis of the Matriculation/HSLC Admit Card/Certificate issued by a recognised Board/Council. No other documents shall be accepted in lieu thereof for the purpose. Interested and eligible Candidates are required to submit their application in the prescribed Standard Form published in the Assam Gazette Part-IX. Completed applications along with all required testimonials should be sent to the following address . Dhemaji State Road Division, Dhemaji. Last date of submission of application form is 20/11/2017 Any application after the date shall not be entertained. 1/ 2 (two) copies of recent passport size colour photograph duly self attested. 2/ Photocopies of the following documents are to be enclosed with the application form and the original copies of the same will have to be produced at the time of verification. (a) HSLC admit card or birth certificate for age proof duly self attested. (b) All marksheets and pass certificates duly self attested. (c) Caste certificate (where applicable) duly self attested. (d) Permanent residentship certificate duly self attested. (e) Up to date Employment Exchange Registration Certificate duly self attested..
(f) Certificate of training, experience, Extra Curricular activities etc. duly self attested. (g) BPL certificate in case of BPL candidate duly self attested. (h) Minimum 6 (six) months Diploma course in computer/Certificate in Computer proficiency from a recognized institution duly self attested. Indian Postal Order (IPO) of Rs. 250/- (Rupees Two hundred Fifty) only for General candidates, Rs. 150/- for SC/ST/OBC/MOBC candidates and NIL for BPL (certificateholder only) candidates, payable to the Executive Engineer, Dhemaji State Road Division,PWRD, Dhemaji should be enclosed with the application form. a) Application submitted in any other mode, except as indicated above, will be summarily rejected without any communication. b) Incomplete form will summarily be rejected. c) The certificate for claiming reservation must be issued by the competent authority. d) Experience in the relevant field will be counted. e) Any information submitted by all applicant in his/her application will bind the candidates personality and if found to be false shall be liable for criminal prosecution apart from civil law. f) The Selection Committee reserves the right to cancel the advertisement, alter any terms and conditions of the advertisement at any stage. g) All other matters regarding the recruitment process which are not specified herein shall be decided by selection committee . h) Candidates will have to appear in a written test and the date of written test will be intimated in due Course of time. i) The authority shall not be responsible for any postal delay. j) Successful candidates in written test will be called for a proficiency test in computer. k) Candidates already in Government service should apply through proper chennel. l) No. TA/DA will be admissible to the candidates for appearing the examination. m) Canvassing by any means will immediately lead to rejection of candidature. Offline jodi form khon kot paam jonabosun..
and you can see on serial no 1 standard form of application is available for download. where is the application form, from where we get it ?